Anyone looking to buy an iPhone X at launch is probably concerned with keeping their new mobile device as safe as possible. AppleInsider has rounded up a selection of the cases on the market that offer protection with style. If you are looking to get an iPhone X shortly after launch or in the near future, it may have crossed your mind that it is worth buying a case for it, just in case the thousand-dollar smartphone makes a heart-stopping fall to the floor. These cases all provide varying levels of protection to the iPhone X, and cost a lot less than paying for a screen replacement. With a variety of colors to choose from, Apple's line of silicone and leather cases are designed to snugly fit the new iPhone X. The iPhone X Leather Case, which is crafted from specially tanned and finished European leather, is designed to develop a natural patina over time. Like previous generation Apple cases, the iPhone X version has a soft microfiber lining to protect the device from scuffs and scratches. Both the silicone and leather cases are also fully compatible with wireless charging, eliminating the need to remove the cover when connected to a power source. The Apple iPhone X Silicone Case retails for $39.00, while the Leather Case sells for $49.00. Both cases can be purchased from Apple or third-party resellers, such as B&H Photo. Guard against cracks and drops with the Speck Presidio Grip iPhone X case. Featuring an Impactium shock barrier and scratch-resistant matte finish, the Presidio Grip has a raised bezel to protect your OLED screen, along with a no-slip grip. The case is also backed by a lifetime warranty and comes in nine different color combinations. The Presidio Grip iPhone X case is available from Speck for $39.95 with free 2-day shipping. Alternatively, Amazon.com has six of the nine color options for $39.95. A premium smartphone deserves a premium case, and Pad & Quill's Heritage Pocket Book Wallet Case hits the mark. The book-style case features naturally veg-tanned leather sides, a full grain chocolate leather spine, a slate gray leather interior, and a durable baltic birch wooden frame that holds the iPhone X in place. The case also includes spots to insert credit cards and cash, a quick-access viewing space for ID or a business card, and a band to keep the case securely shut. The Heritage Pocket Book Wallet Case is sold by Pad & Quill for $107.95 with coupon code PQ16. With multiple colors to choose from, including basic black, berry pink and rich navy, the Pursuit Series from Otterbox offers iPhone X users a case that's built tough, yet maintains an ultra-thin design that can fit in a pocket. The sealed camera opening protects from dust and debris without sacrificing use, while the included lanyard provides backup protection from loss or drops -- great for traveling or working on job sites. Retailing for $69.95, the Pursuit Series Case for the iPhone X can be purchased at MSRP directly from OtterBox. B&H Photo is also taking pre-orders at the discounted price of $62.96 with free expedited shipping to the lower 48. The Dash from X-Doria is a slimline case with a one-piece construction, with the clear upper section showcasing the iPhone X itself along with a faux leather backing for the lower portion. As well as protecting from impacts on the back and sides, the Dash also features a raised front lip, protecting the display when it falls on its front side onto a surface. Available for $29.99 at X-Doria, the Dash also qualifies for free shipping. The Defense Shield improves upon the Dash by providing military-grade protection, using a combination of hard polycarbonate, anodized aluminum for the frame, and soft rubber. The rear panel is clear to show the full back of the iPhone X, with the case also including a sound channel to redirect audio to the front of the iPhone X, in theory amplifying music and other audio playback. The Defense Shield is available with black, red, rose gold, and iridescent frames, priced at $29.99 through X-Doria directly. Those looking for a protective case without all of the bulk will find the Spigen Rugged Armor case for the iPhone X provides Air Cushion technology that absorbs impacts and protects the screen and camera thanks to raised edges. The carbon fiber accents are aesthetically pleasing and the TPU body resists fingerprints. With an MSRP of $19.99, the Spigen Rugged Armor iPhone X case is on sale for $12.99 in matte black at Amazon.com or $14.99 in midnight blue. The cases are sold by Spigen, but fulfilled by Amazon.com, so Prime users can take advantage of free expedited shipping as well. When life demands a bit of extra shimmer, Case-Mate's line of sparkly cases for the iPhone X fits the bill. The Brilliance Tough case, in particular, is covered with over 800 genuine crystals while still maintaining the iPhone X's wireless charging capability. And while it looks great, it doesn't skimp on protection either thanks to military strength (MIL-STD-810G) impact protection. Retailing for $80, several colors are available to complement the iPhone X. Amazon currently has the cases for $55.60 to $58.33 with free shipping, a discount of $24 or more off MSRP. The Naked Tough case is clear, allowing for the entire iPhone X to be visible from all angles, while also keeping it safe. Boasting military-grade impact protection with its two-piece construction and shock-absorbing bumper, it is also produced from UV yellowing-resistant materials and anti-scratch technology to maintain its appearance, has metallic buttons, and works with wireless charging. Amazon currently has the Naked Tough iPhone X case on sale for $29.99, which is $5 off MSRP. Caseology's Parallax case provides iPhone X users with an affordable cover that protects against drops and scuffs thanks to its composition of TPU and PC material. Color options include black/warm gray, burgundy, ocean gray and pine green -- and each case has a textured geometric pattern for better grip, as well as a raised lip for enhanced protection. Caseology is currently offering the Parallax cases in all four colors for $13.99 through Amazon, a discount of $11 off MSRP. As the name suggests, the Base Grip from Silk Armor offers users a large amount of grip on the back and sides of the casing, reducing the chance of it slipping from the user's hands. 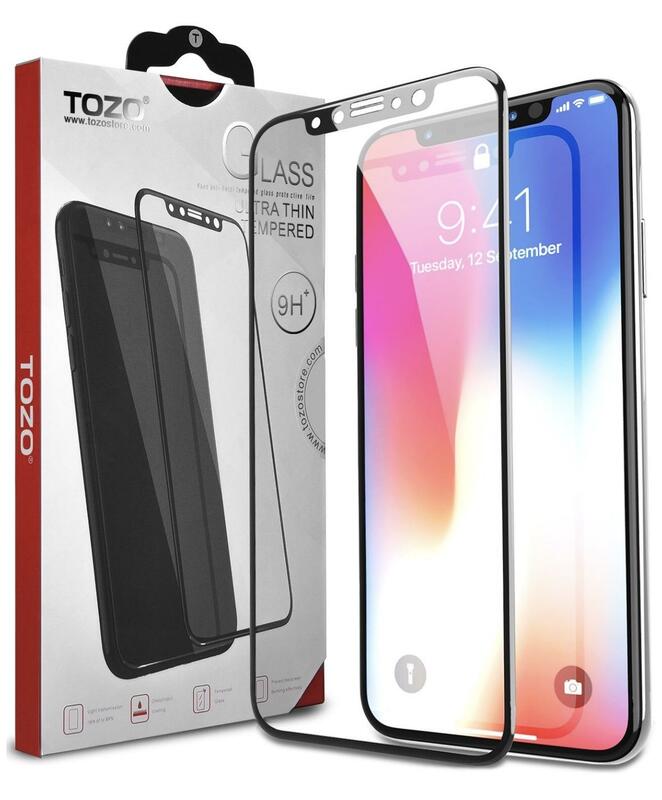 The case itself is thin and light, with air-pocket corners to help cushion impacts, holds the screen away from tables when laid face down, and is supplied with a screen protector. Available in black onyx, crimson red, blue jade, and purple orchid, the Base Grip is priced at $11.99 from Silk on Amazon.com. The Silk Armor goes for a more rugged appearance, with soft rubber grips around the edge for extra padding, and a tempered glass screen protector for the display. On the back is an inlaid crystalized pattern, and the company claims the tactile side buttons offer a better "click" response when pressed. Shipping in clear and crimson red options, Silk sells the Silk Armor for $19.99. 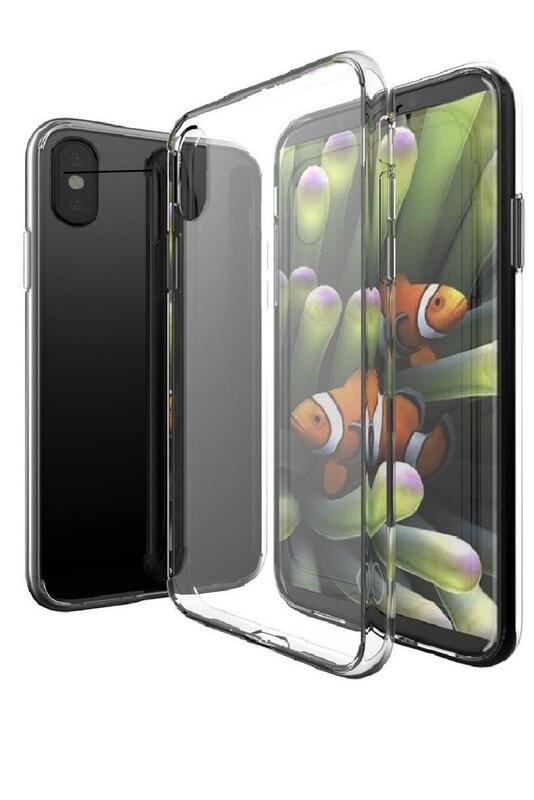 If you want to both see the back of your iPhone X and cover it in art, consider the Victoria case line from Gear4. The range includes four designs, with the Victoria Geo Teal Gold and the Victoria Gold pictured above accompanied by the swirls of the Victoria Blue and the muted Victoria Coral. All of the Victoria cases are slim-fitting while still protecting the iPhone X via its use of D3O, an impact absorbing material that is also used by the military and athletes. Each case can be acquired from the Gear4 store for $39.99, with some models available on Amazon for the same price. The DualTek HIP case from PureGear is a highly protective case featuring layered materials, shock absorbing corners, and an ergonomic grip. What differs is that it includes a hip holster, an extra section that clips onto the case so it can be held on a belt loop. The clip system can hold the case with the iPhone X display facing into the clip plate or out, giving more protection to the screen. The clip is able to rotate 360 degrees, and can also be used as a kickstand. The PureGear DualTek HIP case is available at Amazon for $44.99 with free shipping. If you're looking for a classical yet practical way to holster your iPhone X, consider the Ranger iPhone X Case from Waterfield Designs. Produced from naturally-tanned full grain leather with an Ultrasuede liner, this case can be attached to a belt or other garment using the magnetically-held belt loop. The flap holding the iPhone X in place is secured with a locking magnetic fastener, which won't open without a downwards tug on the tab, with an extra front compartment capable of holding the AirPods case, and a lower cutout for access to the Lightning connector. Available in a choice of black or chocolate leather, Waterfield Designs is selling the Ranger iPhone X Case for $89. The Olixar X-Trex Rugged Kickstand Case is a heavy-duty accessory that provides multi-layered protection, using reinforced polycarbonate and shock-absorbing thermopolyurethane to protect from drops To help improve grip, a number of rubberized non-slip bumper pads with textured surfaces keep the iPhone in place when put on a smooth surface. On the back is a compartment able to hold two credit cards, along with a fold-flat kickstand. The Olixar X-Trex is available in red and black color options from Olixar on Amazon, priced at $19.99. Editor's note: This article was originally published last week, but has been republished to coincide with the launch of the iPhone X.
I like the Speck, Spigen and X-Doria cases in particular. I'd like to know which cases don't work with wireless charging since it would be a major annoyance to keep removing the case to charge the phone. Do people really buy (and use) these ugly, rough and bulky cases to hide their beautiful and finely designed iPhones? IMO The only good option is a fully transparent case. Serious? You think I’m going to put these ugly cases on my beautiful precious? Lol. I’ll go for these: front and back! Wireless charging works thru case. See Apple’s leather case? Can anyone suggest an iPhone X case with a kickstand? Of course putting a $1000 iPhone in a cheap looking case doesn't make sense. iPhone X in an Apple leather case looks great. Caudabe clear case should have been featured. Excellent product and company. Got mine ready for this Friday's X delivery. The Seidio Surface has a kickstand. Make sure to consider the fact that the screen goes all the way to the bottom and the new gesture for getting to the home screen is swiping up from the bottom. Any case with a bottom lip may impead this expierence. I went with the Apple leather case for now just for this reason. Hopefully other manufacturers catch on, but it doesn’t look like they have out of the gate. After spending a lot of time look at dozens and dozens of cases, I've decided to go with Apple's new iPhone X case ($99). My constraints were, leather + wallet. Having a wallet at the back (like I've preferred it in the past) might interfere with wireless charging, so I figured I would need to get one in the inside sleeve. However, the typical ones -- like the P&Q one shown here -- have credit cards that stick out and in the process, smudge (or even possibly scratch) the screen. Apple's seems to be only one where the inside sleeve fully covers the credit card. At what point does an iPhone 7 without a case, feel more advanced than the iPhone X with a bulky protective case? Full screen OLED with Notch: priceless! I am going to miss Apple's smart battery case. I use it with my iPhone 7 and love it for so many reasons. The primary one is double the battery life. Why isn't it available for iPhone X? Vaja for looks, Otterbox for backpacking protection.